St Philemon became bishop of the city of Gaza, and he preached the Word of God throughout Phrygia. The holy Apostle Paul continued to be his guide, and addressed to him his Epistle filled with love, and in which he sends blessings "to Philemon our dearly beloved, and fellow laborer, and to our beloved Apphia, and to Archippus our fellow soldier, and to the church in thy house" (Phil 1:1-3). St Onesimus (February 15), also mentioned in the Epistle, was St Philemon's former slave. Sts Philemon and Apphia, and also St Archippus (who also lived at Colossa), all received the crown of martyrdom during the persecution of Nero (54-68). During a pagan festival an enraged crowd rushed into the Christian church when services were going on. All fled in terror, and only Sts Philemon, Archippus and Apphia remained. They seized them and led them off to the city prefect. The crowd beat and stabbed St Archippus with knives, and he died on the way to the court. 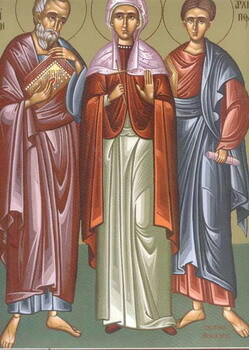 Sts Philemon and Apphia were stoned to death by order of the prefect. Onesimus, together with Mark and Apollos, and the all-wise Apphia. "Unceasingly pray for us all!"